This name falls somewhere between classic Matthew and trendy Madison. Henri Matisse was born in 1869. Over the course of his career, he transitioned from a disruptive force to one of the fathers of modern art. Or maybe he was both all along, but it took the world a while to catch up. At first, Matisse was considered one of les Fauves – the wild beasts. They were known for vivid color, violent brush strokes, and abstract subjects.But Matisse’s style continued to evolve. He became friends – and s ometimes rivals – with another visionary artist, Pablo Picasso. Later in life, poor health made painting difficult, and he turned to decoupage and cut-out paper collages. His works are widely recognized today, and exhibitions of his work draw huge crowds. I couldn’t find a satisfying explanation for the origin of Matisse. Most accounts suggest that it is related to Matthew, via the French Mathieu. 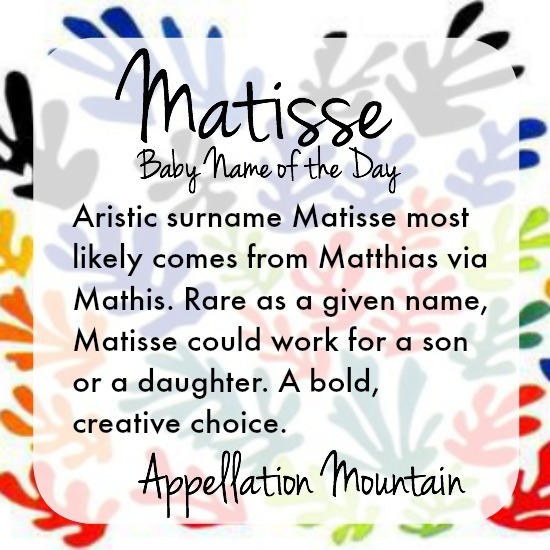 This makes sense – in French, Mathis sounds pretty close to Matisse. Mathis comes from Matthias, a New Testament name with a long history of use. 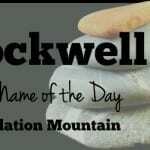 In English, it’s most commonly Matthew, but lots of of Mat- names are familiar. One Mat- name that has never really taken off is Mattea, the Italian feminine form. But plenty of Mat- and Mad- names have been huge for girls in recent years – they’re just not related to Matisse. There’s vintage Matilda, modern Madison, and how-do-you-spell-that Madeline/Madelyn/Madeleine/Madilyn. The Mads have, of course, given rise to Mad- boys like Maddox and Madden, too. 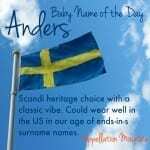 The name’s -isse ending fits with girls’ names like Clarice and Patrice, names that feel stuck in style limbo, as well as surname Reese, boosted by Hollywood A-lister Reese Witherspoon, but also popular with our sons. 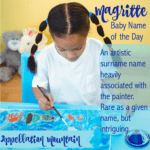 Both because the surname comes from such a popular name, and because the name sounds like a lot of stylish choices in recent years, no surprise that we’ve seen some children named Matisse. The first time I heard the name Matisse was during a street festival, a dozen years ago. The mother was calling after her daughter, who must have been six or seven. 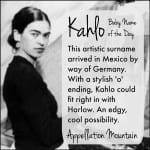 That would make my Matisse born in the late 1990s, and among the first wave of girls given this name. Well, not the first. Actress Monet Mazur has siblings with similar artist surname names, including brother Matisse. In 1988, five girls were given the name. The year before, one of Matisse’s paintings was stolen from Stockholm’s museum of modern art. Could that event have bumped up mentions of Matisse and prompted parents to consider the name? Madison was surging up the popularity charts at the time, too. But unlike Madison, Matisse never quite caught on. In 1999, there were 17 girls and 7 boys given the name. By 2010, that was 18 boys and 7 girls. In 2014, it was just 8 girls. Still, those numbers are so minimal, it’s tough to call any of them a trend. There haven’t been many high-profile bearers of the name. I did find a pop singer-songwriter who goes by the name Matisse – born Brittany Smith. And short-lived ABC Family ballerina comedy-drama Bunheads included a supporting character by the name, played by a young actress also named Matisse. All of this makes Matisse a fascinating possibility. Creative, gender neutral, tied to a traditional name but with a modern feel, vaguely French but accessible in English. If you’re after a rarity, Matisse is one to consider. What do you think of Matisse? Is it better for a boy or a girl? My youngest daughter’s name is Matisse. She was born in Feb 2012. Her sister’s name is Anouk (22 months older than Matisse). We are very happy with our names choices and they/we are always getting compliments on their names. 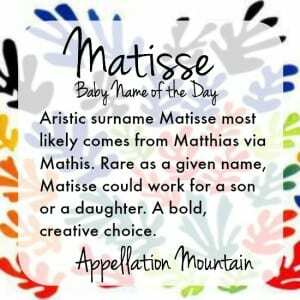 My Daughters name is Matisse named after her Father Matthew. We always get compliments saying how pretty and feminine her name is. She a very sweet happy go lucky child she’s very kind and loving child. She gets “Tissie” as a nickname. I like it! I’ve considered Mathis for a boy. I think Matisse could work for a boy or a girl. I love this one! I think it’s very feminine sounding though, so I wouldn’t give it to a boy. Matisse falls somewhere between classic Matthew and trendy Madison? That is an interesting take. The downside is that Matisse rhymes with Bernice, so a really out-of-style sound. Matisse seems like it would be a good sibling paring to Paris or Bentley. I went to grade school with a girl named Matisse- she would have been born in 1987/1988, so one of the 5! I was always intrigued by her name, it definitely stuck out in our little Catholic school. The last name of our church’s rector is Matisse. She is a lovely, admirable woman and priest, but I can’t see Matisse as a given name.